Commodities rose broadly on Friday as the dollar fell to a near four-month low against the euro after disappointing U.S. job numbers for August led to bets there will be more stimulus for the world’s largest economy. Gold prices rushed to a six-month peak, copper hit a near 4-month high and oil rose for a third day as investors speculated the Federal Reserve will launch a third round of quantitative easing or bond buying to help the U.S. economic recovery. Logically, any Fed easing tends to boost asset prices, including that of commodities, as it weakens the dollar. The dollar fell to as low as $1.2806 against the euro, its weakest level since late May. 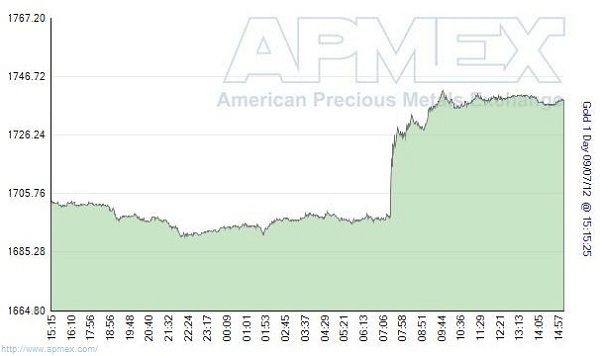 As the article noted, gold prices went up 2% for the day, and 11.1% for the YTD. The stock market remained relatively stable, with all indices up a fraction of a percent. If Fed chairman Ben Bernanke carries through and QE3 goes into effect, many analysts think these gains will solidify and gold prices will continue to climb. …a number of analysts raised their year-end forecasts for gold prices. A quick survey: J.P. Morgan Chase called for gold to close the year at $1,800; Goldman Sachs said $1,840; Bank of America Merrill Lynch suggested $2,000 in the event of QE, and one Citigroup analyst called for gold to reach $2,500 by the end of the first quarter 2013, and even higher in the event of geopolitical conflict. Others think Friday’s jump in commodity prices has QE3 “built in” as an assumption — if QE3 proceeds, gold prices remain stable; if not, they fall to previous levels. From a long-term perspective, I find this hard to believe: as long as political leadership around the world continues to kick the irresponsible fiscal policy can down the road, gold prices will continue to climb in a fiat currency environment. We should hear more about QE3 when the Fed next meets on September 12-13. This entry was posted in News and tagged economy, gold, gold prices, quantitative easing, u s global investors. Bookmark the permalink.